Took place north of Chihuahua, Mexico and was a brilliant victory for the Americans. Sketch of the Battle of Sacramento Feb. 28th, 1847. This is an 1847 U.S. Government map of the Battle of the Sacramento River, Chihuahua, Mexico, during the Mexican-American War. 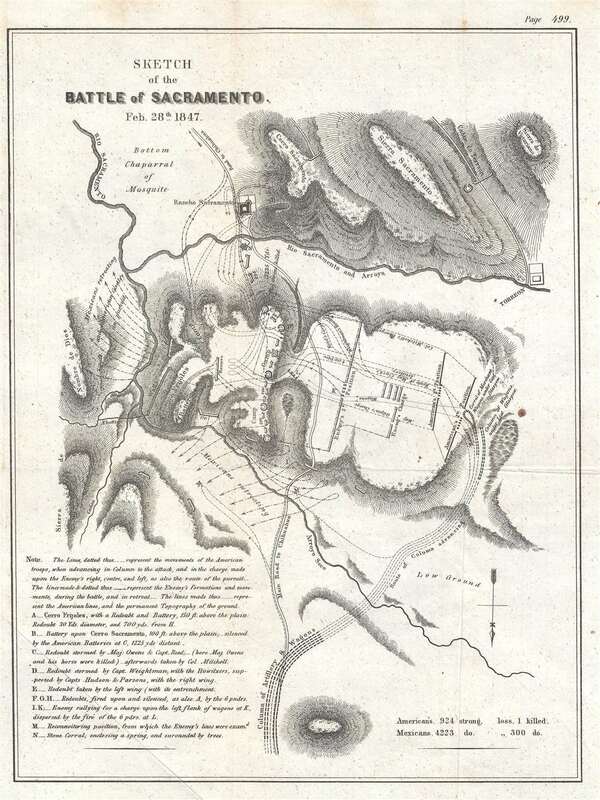 The map illustrates the battlefield from the Cerro Sacramento to the Arroyo Seco and from the Sierra de Nombre de Dios to Torreon. Highly detailed, the map illustrates the many maneuvers undertaken by both American and Mexican troops. The positions of American and Mexican troops are traced, as is the advance of the American artillery. Most of these movements are labeled, though in the chaos it can be difficult to know exactly what action is being depicted. Twelve different locations are identified alphabetically, which corresponds to a key situated at the lower left. The note at bottom right perhaps summarizes all that one needs to know about this battle: the Mexicans outnumbered the Americans by more than four to one, yet only one American was killed, with the Mexicans suffering 300 dead. This map was published by the U.S. government in 1847. Though fairly well represented in institutional collections, this map rarely appears on the private market. United States Senate, 'Message from the President of the United States to the Two Houses of Congress, at the Commencement of the First Session...December 7, 1847. ', 30th Congress, 1st Session, No.1 (Washington: Wendell and Van Benthuysen) 1847. Very good. Light wear along original fold lines. Close left margin. Some creasing. Blank on verso.